Holiday Shipping Deadlines: To ensure delivery for Christmas, orders must be placed by Monday, December 10th. Local pickup order must be placed by Wednesday, December 12th and picked up by Friday, December 14th. 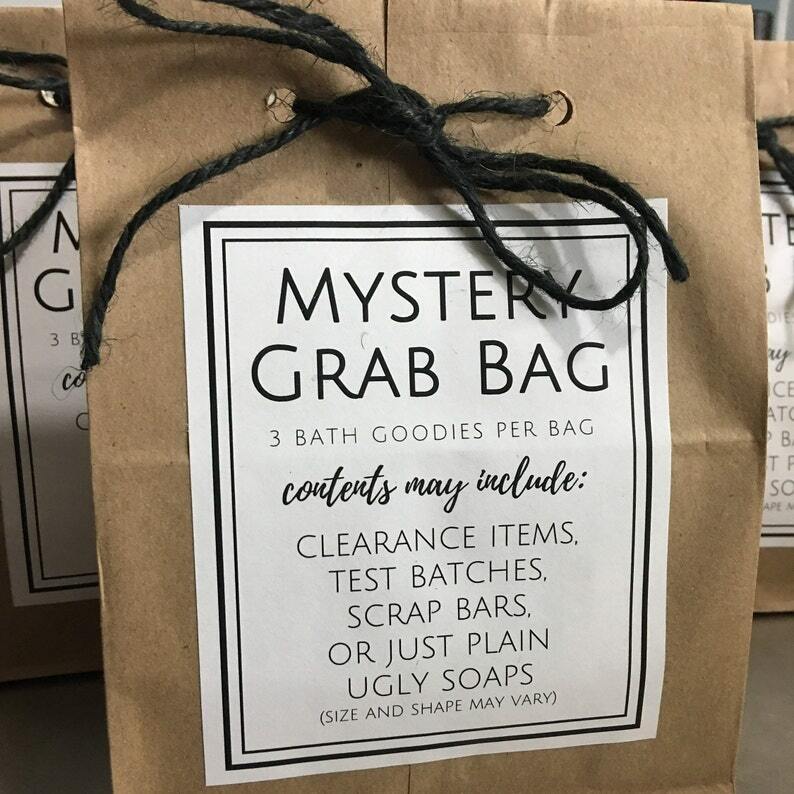 Our Mystery Grab Bags are a customer favorite and you never know what you're going to get! You could find clearance items, test batches, scrap bars or just plain ugly soaps, because unfortunately, they don't always come out looking like we hope they will. Each Mystery Grab Bag contains 3 bath goodies and this listing is for one bag. Some bags may contain non soap items such as bath salts, loofas, sprays, scrubs, etc. - You'll often find clearance items, which are usually out of season surplus items or slightly defective items whose labels may have been worn or marked, or there may be dings from over handling. These items make their way into the goodie basket to await the next mystery bag fill. - Maybe I tested a new fragrance, color combination or pouring technique, but it's not quite perfected yet, so off it goes to the goodie basket. - Perhaps I have a bunch of scraps left over after cutting or designing other soaps. These scraps go into a larger mold and get a new layer of soap poured over them and are then cut into use-able bars and tossed into the goodie basket. - And sometimes, no matter how many times I've tried, the soap just comes out ugly, at least to me, since I always have an exact idea of what I'd like to see in my soaps. Those ugly ducklings also go straight into the goodie basket. All of this goodness is perfectly safe to use as you would any other soap or sundries you would normally purchase in my shop, just slightly uglier, but most certainly just as good for your skin as their prettier friends on the shelf.